A motorist who was over twice the drink driving limit was banned from the roads for 16 months last Friday at Craigavon Magistrates Court. 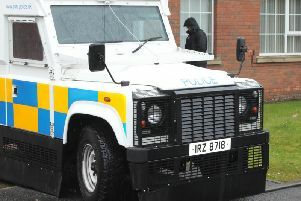 Steven Breen (33), whose address was given to the court as Forest Glade, Lurgan, was also fined £250 and ordered to pay a £15 offender’s levy. On completion of a drink driving course his ban would be reduced. The court heard that at 1am in Church Place a car cut in from the outside lane in front of a police vehicle and indicators were not used. Breen failed an initial breath test and an evidential sample gave a reading of 89 microgrammes of alcohol in 100 millitres of breath - the legal limit is 35. Mr Peter Murphy, representing the defendant, said he had no previous convictions and had been driving for two years. He explained that Breen had parked the car and gone for a couple of drinks but foolishly decided to take the car to go and get something to eat. District Judge, Mr Peter King, said the reading was more than twice the legal limit and the minimum ban of 12 months was not appropriate. But he said the defendant was suitable for the drink drive course which, if he completed it, would reduce the length of the ban.